The big deal here is that AT&T U-verse was available to all Silver members and will now require a Gold membership to partake in all the entertainment features. Good on AT&T for fronting the cost of a 1 year of membership but we will wait and see how many users decide to keep the Live membership after the initial year. 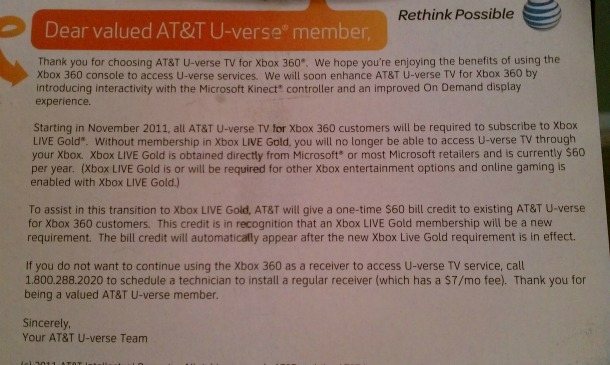 It's not clear if Gold members who have AT&T U-Verse will also receive the credit, but I'm pretty sure they will. Currently Verizon will be rolling out "Select" channels to XBox Live while Comcast will release its entire On Demand selection. More details are rolling out every day so it doesn't look like anything is set in stone yet.